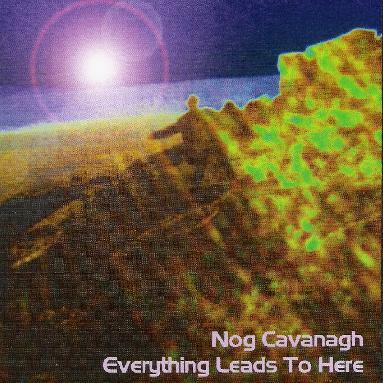 Nog Cavanagh - "Everything Leads to Here"
Multi-instrumentalist Nog Cavanagh explores the universe from his home studio with his all instrumental music that draws on classic guitar space rock and a more modern synth driven kind of psychedelia as its influences. On his debut solo album, Everything Leads To Here, Cavanagh focuses his guitar leads more on textural design than flashy solos or foreground melodies. In fact, melody takes a somewhat background role in favour of rhythm and texture, so this could be likened to ambient techno in that sense, but with lots of guitar, and definite riff changes over the course of each piece. Sometimes the rhythms are clear and distinctive, like the propulsive and driving rhythm of the opening track, Scorpia Mossmoon. But Cavanagh also delves into murkier rhythms like on the next track Tiny Beams of Light, created with pulsing live bass playing combined with programmed percussion. Synths and electronics are usually used for space washes and gurgling effects. But when they occasionally take the lead it's to powerful effect, such as on the Middle Eastern influenced Samarkand, which has an almost cinematic quality to it, like the soundtrack to some Egyptian sci-fi movie. Through dark textures and spacey psychedelic excursions, the album ends on a soaring note with It Can Be As Big As You Want It, which reminded me of some of the bright, upbeat kind of playing heard from Hawkwind in the early 80's on albums like Levitation. But the title also sounds like a description of Cavanagh's vision, and even though this is the culmination of recordings done from 1997 - 2004, I'm sure it won't be long before we hear more from this Yorkshire space rocker. For more information you can visit the Nog Cavanagh web site at: http://nogcavanagh.mysite.wanadoo-members.co.uk.